Perth is Australia's sunniest capital city, the perpetually cerulean skies make it the perfect place to immerse yourself in the laid-back outdoor lifestyle, sensational beaches and the glistening turquoise waters of the Indian Ocean make it a paradise for nature and outdoor lovers, the city has a wealth of vibrant bars, cafes and restaurants and plenty of cultural, art and historic attractions. Western Australia's capital city Perth lies under perpetual cerulean skies, sensational white sand beaches and the turquoise waters of the Indian Ocean make it a paradise for nature and outdoor lovers, Perth is abuzz with vibrant bars, restaurants and cafes, the city offers a wealth of great shopping, historic and cultural attractions. Whaleworld Interpretation Centre, the Gap, Natural Bridge, Luncheon Cruise, Tree Top Walk, Dinner, Overnight Pemberton Accommodation. 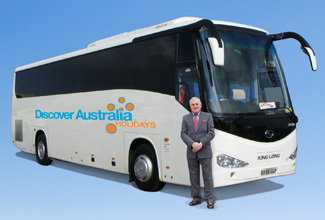 Your special overnight Luxury Coach Touring includes 9 meals. The luxury vehicle has a personalised air-conditioning, a video system and an onboard toilet. The Perth, Margaret River, Albany & Tree Top Walk Touring is very popular. Many dates book out well in advance, please book soon.